The Heart is a Nursery for Hope by Elaine Reardon is a small collection poetry. 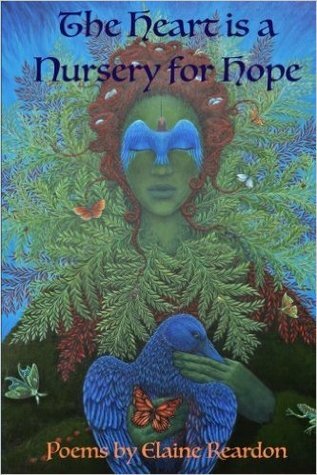 Reardon combines an interesting mix of spirituality, life, seasons, and hope in her poems. From the cold of winter to the hot spring in Mexico, the poetry will take a reader on a journey. The poetry is written in free verse and holds a level of maturity and a natural flow. The topics vary in the collection but all the poems are well grounded. The poems tie in well together whether Reardon is writing about the depths of winter or an old toaster. Reardon writes with reflection but the depth of the poems is within the grasp of the recreational reader. A nice and easy to read collection that misses all the expected cliches and triteness one usually sees in these collections. Well done. Lovely! Thank you. I look forward to exploring your site. I agree with this review, Reardon touches on the spirituality that we try and obtain but often slips through our conscious world. I think she could lead people into an awareness of their surrounding that would benefit all who would listen.